Every Reader Report that comes into my mailbox is a welcome find, but Susan Mack’s report on gluten-free Austin is extraordinary. While I knew that the capital city of Texas was a paradise for music-lovers (Asleep at the Wheel, one of my favorite bands, is based there), I had no idea it was a mecca for gluten-intolerant people, too. I’m hoping that I’ll be able to use the information in Susan’s report when I visit Texas on my book tour in October. 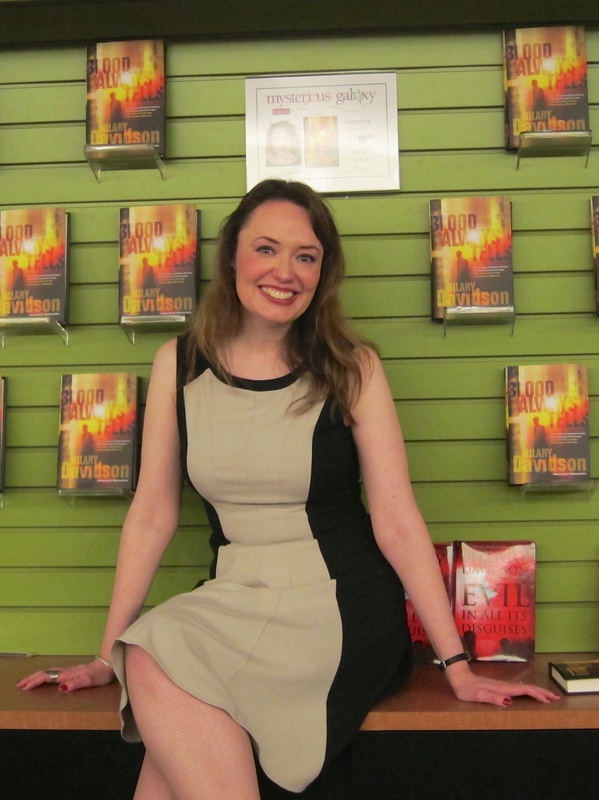 (I’ll be discussing and signing my debut mystery novel, The Damage Done, at Houston’s Murder by the Book on Saturday, October 30th at 5pm; I’m hoping to add an Austin event to my schedule soon.) A huge round of applause for Susan’s incredibly helpful report, and a heartfelt thank-you to her for taking the time to share so much information! I’ve lived in Austin for seven years, and have had to go gluten-free in the past six months. In talking to friends from other cities, I have to say that if you have to be gluten-free, Austin seems to be the place to do it. If you’re looking for a vacation spot – Austin is famous for our Austin City Limits music festival in October (where you will find carnival food stands with GF options) and our SXSW music, film and interactive festival in the spring. But any weeknight of the year, you will find at least 75 live music events, several local theatre production, some UT sporting event, or a great organized athletic group. Plus, in the spring, we have wildflowers in the Texas Hill Country. We have a plethora of good, locally owned restaurants in a wide variety of price ranges. Almost every one of them is sensitive to gluten intolerance. There is no reason to go to a restaurant that doesn’t have a gluten-free menu. If your waiter doesn’t understand your needs – walk out. You can find a perfectly good option within a couple blocks. And although I’ve picked out several places that I think are particularly good or sensitive – I’ve even gone to food trailers that had gluten-free lists. Almost any restaurant is going to have safe options. We have a strong locavore culture. We’re the headquarters of Whole Foods. And until recently, the local Whole Foods was dwarfed by another store: the HEB chain flagship – Central Market. In addition, we’ve recently gotten Sprouts, the Natural Grocer, and Sunflower Farmer’s Market – all of which join the local People’s Pharmacy in delivering gluten-free options. So, without much ado, here are some gems that you can find in Austin. Wild Wood Art Café — 3663 Bee Caves Road, #4A Austin, Texas 78746. Wild Wood is an entirely gluten-free bakery and café. Imagine walking into a restaurant and ordering a sandwich or lasagna! But really, it is their tamales, salads and desserts that shine. Their gluten-free ding dongs are to die for — even if you didn’t want to eat ding dongs in your gluten-eating days. TalkHouse — 1221 W. Sixth Ave, Austin, TX 78703. This small café connected to a beauty salon serves food that tastes so good, you might not even notice that it’s good for you! A raw food restaurant that is entirely gluten-free, TalkHouse is shocking. Their ‘pizza’ and chile rellenos are so good that my gluten-eating, meat-eating husband wants to eat there more often! No gluten comes through the door. MyFitFoods — Various locations. This place serves single serving meals that you can reheat in the microwave. They specialize in supporting a 21 day cleanse — but they have many quick meals that are worth saving for a hotel-room breakfast or lunch on the go. No gluten or soy enters their facilities. Galaxy Café — Various locations — A local chain run by an owner sensitive to gluten intolerance. You can get breakfast wraps in gluten-free rice tortillas and a wide variety of menu options. They can’t utterly promise to avoid cross-contamination, so they don’t claim their flourless chocolate cake is gluten-free. But if you can risk a few grains in your food it is to die for. Kerby Lane Café — Various locations — One of the more extensive GF menus in town. Open 24 hours. They are sort of like a Denny’s that offers enchiladas and local produce selections. Salads are incredible, as are their enchiladas. 24 Diner — 6th and Lamar — A new ‘locavore’ restaurant. They don’t have a GF menu, but can tell you what is safe. They make their own sausage in house and can tell you which farm the produce came from. Counter Café — 626 N. Lamar Blvd — “Counter culture” reigns here. A small diner that serves local produce while you sit at the counter. Their eggs are absolutely to die for – as is their quail salad on the lunch menu. The hipster staff is completely aware of food intolerance issues and will very carefully cook your food separately to take care of you. Maudie’s — Various locations — Ask for the gluten-free corn chips and they will help you out. A wide variety of gluten-free options and utterly conscientious. Torchy’s Tacos — Various locations — This place will make you rethink your definition of taco. They raise tacos to a gourmet form of art. And they have a list at the register of which items are and are not GF. You might have to skip the fried avocado taco, but the grilled fish, barbacoa, or green chile pork are all safe when you eat them on one of the best corn tortillas you will find. Zocolo — 1110 West Lynn Ave, 78703 — Fresh Mexican? Really? This place offers goodies like vegetable stew, jicama salad and an amazing black bean soup in addition to fresh tacos and amazing enchiladas. As long as your corn tortillas stay out of their deep fryer, you have a lot of great GF options — and they are aware of cross contamination issues. Terra Burger — 10611 Research Blvd. — Organic burgers. Gluten-free buns. Organic shakes made from real gluten-free ice cream. Unbreaded fries made from real potatoes. And a playscape. And a water park. Need I say more? Austin’s Pizza — Various locations — Gluten-free pizza delivered. And the toppings are amazing. Brick Oven on 35th — 1608 W. 35th St — This Italian restaurant advertises and offers a wide variety of gluten-free pastas and pizzas. If you want to go out, sit down and eat — this is a great option! La Condesa — 2nd and Guadalupe — If the menu is not gluten-free, they will make it so. This is one of the best restaurants in Austin and a huge part of the local food movement. They do a Mexico-City inspired Mexican Fusion cuisine that is not to be missed. And their pastry chef can put together gluten-free treats if you are interested. Olivia — 2043 S. Lamar — Rated one of the best new restaurants of 2009 by Bon Appetit, this place is worth a splurge. Home-made ice cream, home-made charcuterie and just good food. They will prepare something special if you challenge them with GF. Whole Foods Corporate Headquarters — Lamar between 5th and 6th — If Whole Foods married Costco, you might get the impression of the sheer floor space of this place. With an entire grocery store aisle and an entire frozen food aisle dedicated to GF products, you can find most of what you want from cookies, to breads to beers. If a flour isn’t in the GF aisle, it might be in the standard cooking aisle. And you can find pure buckwheat soba, and GF cooking sauces in the Asian aisle. If it can be done GF, you can probably find it here. Central Market — 35th and Lamar — The major competition for Whole Foods and possibly the inspiration for their floorspace. There is a full aisle and frozen section with GF goodies. They frequently host GF cooking classes for the uninitiated. Fresh Plus — 12th and West Lynn — If you don’t have time for a big store, and just want to pick up some staples, this neighborhood market is very impressive. With high end cheeses, goats milk ice cream, kambucha tea and a gluten-free aisle — you will be pleasantly surprised. It looks from the front like a convenience store, but the selection is incredible. And you can get in and out in five minutes! Sprouts — 2 locations — New to Austin, Sprouts Natural Foods is giving the big guys a run for their money. They recently ran a 25% off all gluten-free products special, and most of the store had GF signs all over it. Several bargains to be had from this natural foods competitor. Wheatsville Co-op — In Austin for more than 30 years, this small co-op ‘gets it’ about GF. In addition to the standard products, they do ‘Wheat-free Wednesday’ where their bakery goes GF and they sell home-made goodies.